Natasha Lyonne (/liˈoʊn/; born April 4, 1979) is an American actress, writer, and producer. She is best known for her portrayal of Nicky Nichols in the Netflix series Orange Is the New Black (2013–present), for which she received an Emmy Award nomination in 2014, and for her role as Jessica in the American Pie film series (1999–2012). Lyonne is currently starring as Nadia Vulvokov in the Netflix series Russian Doll, on which she also serves as an executive producer. Lyonne has appeared in over 50 films, including: Everyone Says I Love You (1996), Slums of Beverly Hills (1998), Detroit Rock City, But I'm a Cheerleader (both 1999), Scary Movie 2, The Grey Zone, Kate & Leopold (all 2001), Party Monster, Die Mommie Die! (both 2003), Blade: Trinity (2004), Robots (2005), All About Evil (2010), Sleeping with Other People, Hello My Name Is Doris, Addicted to Fresno (all 2015), Yoga Hosers, Antibirth, The Intervention (all 2016), and Show Dogs (2017). Natasha Lyonne (/liˈoʊn/; born April 4, 1979) is an American actress, writer, and producer. She is best known for her portrayal of Nicky Nichols in the Netflix series Orange Is the New Black (2013–present), for which she received an Emmy Award nomination in 2014, and for her role as Jessica in the American Pie film series (1999–2012). Lyonne is currently starring as Nadia Vulvokov in the Netflix series Russian Doll, on which she also serves as an executive producer. Lyonne has appeared in over 50 films, including: Everyone Says I Love You (1996), Slums of Beverly Hills (1998), Detroit Rock City, But I'm a Cheerleader (both 1999), Scary Movie 2, The Grey Zone, Kate & Leopold (all 2001), Party Monster, Die Mommie Die! (both 2003), Blade: Trinity (2004), Robots (2005), All About Evil (2010), Sleeping with Other People, Hello My Name Is Doris, Addicted to Fresno (all 2015), Yoga Hosers, Antibirth, The Intervention (all 2016), and Show Dogs (2017). 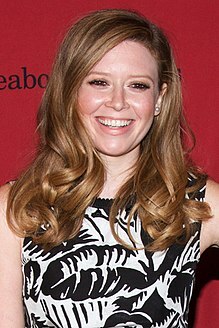 Lyonne was born in New York City as Natasha Bianca Lyonne Braunstein, the daughter of Ivette Buchinger and Aaron Braunstein, a boxing promoter, race car driver, and radio host, who was distantly related to cartoonist Al Jaffee. Lyonne spent the first eight years of her life living in Great Neck, New York. She and her parents then moved to Israel, where Lyonne spent a year and a half. During her stay in Israel, Lyonne participated in the production of the Israeli children's film April Fool, which began her interest in being an actress. Her parents divorced, and Lyonne and her older brother Adam returned to America with their mother. After moving back to New York City, Lyonne attended The Rabbi Joseph H. Lookstein Upper School of Ramaz, a private Jewish school, where Lyonne said she was a scholarship kid who took honors Talmud classes and read Aramaic. She was expelled for selling marijuana at school. Lyonne grew up on the Upper East Side, where she felt she was an outcast. Her mother then moved their family to Miami, where Lyonne attended Miami Country Day School. She never graduated from high school; she left before her senior year to attend a film program at NYU's Tisch School of the Arts. Her high school graduation depended on completing her first year at Tisch, but she left the program because she could not pay the tuition. At 16 years of age, Lyonne was cast in the Woody Allen-directed Everyone Says I Love You (1996). This led to appearances in a variety of films over the next 10 years, including starring roles in the independent features Slums of Beverly Hills (1998), for which she received two Teen Choice Award nominations, and But I'm a Cheerleader (1999). During this time, she appeared as Jessica in the highly successful teen comedy American Pie (1999), reprising the role in two of its sequels. Lyonne's other films during this period included Detroit Rock City, Freeway II: Confessions of a Trickbaby (both 1999), Scary Movie 2, The Grey Zone, Kate & Leopold (all 2001), Party Monster (2003), and Blade: Trinity (2004). In 2019, she will appear alongside Lucas Hedges and Shia LaBeouf in LaBeouf’s autobiographical film Honey Boy. In 2014, Lyonne was cast in Amy Poehler's NBC comedy pilot Old Soul, directed by David Wain. In 2016, she began voicing the character Smoky Quartz on Cartoon Network's Steven Universe. She has also appeared as various characters on IFC's sketch comedy series Portlandia. In 2018, she voiced the character Gaz Digzy on Adult Swim's comedy series Ballmastrz: 9009. More recently, she has voiced characters on The Simpsons and Netflix’s Big Mouth. In 2017, Lyonne was approached by Kenzo’s creative directors Carol Lim and Humberto Leon to direct the 5th installment in their short film series. For this, her directorial debut, she began writing a script with Maya Rudolph in mind to star. The surrealist short film, was titled Cabiria, Charity, Chastity, and starred Rudolph, Fred Armisen, Greta Lee, Leslie Odom Jr., and Macaulay Culkin. In September 2017, Lyonne’s new project Russian Doll was given an 8-episode straight to series order by Netflix. The comedy, co-created and executive produced by Lyonne, Amy Poehler, and Leslye Headland, premiered on February 1, 2019. 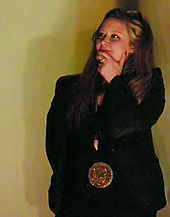 Currently, Lyonne serves multiple roles in the series. She is credited as the lead actress and is one of the executive producers of the series with directorial and writing credits. Lyonne will also be directing an episode of Orange Is the New Black for its seventh and final season. When she was 18 years old, Lyonne used the paycheck from her work on Everyone Says I Love You to buy a small apartment near Gramercy Park. At this time, she skipped her senior year of high school to attend NYU Tisch as a double major in film and philosophy. In 2005, Lyonne was admitted to Beth Israel Medical Center in Manhattan under a pseudonym, suffering from hepatitis C, a heart infection, and a collapsed lung; she was also undergoing methadone treatment. In January 2006, an arrest warrant was issued for her after she missed a court hearing relating to her prior problems. Her lawyer said an emergency had arisen, but did not give details. Later that year, Lyonne was admitted to a drug and alcohol treatment center, and appeared in court afterwards. A judge sentenced her to conditional discharge. She has been in a relationship with Saturday Night Live alumnus Fred Armisen since 2014. Law & Order: Special Victims Unit Gia Eskas Episode: "Educated Guess"
Comedy Bang! Bang! Katie Episode: "Dax Shepard Wears a Heather Grey Shirt and Black Blazer"
Sanjay and Craig Chido (voice) Episode: "Bike-o Psycho/Boulder Rollers"
2018 Corporate Gretchen Episode: "Corporate Retreat"
Animals. VHS Copy of Can't Hardly Wait (voice) Episode: "Stuff"
The song "Natasha" from Want One by Rufus Wainwright was written for and about Lyonne. Natasha also starred in the music video to "333" by the punk-rock band Against Me!. 1 2 3 4 5 6 7 8 Maron, Marc (October 14, 2013). "Episode 432 - Natasha Lyonne" (audio podcast). WTF Podcast. Retrieved March 1, 2014. ↑ "Natasha Lyonne Biography". TVGuide.com. Retrieved August 26, 2014. 1 2 Barkan, Ross (29 August 2013). "Offbeat Boxing Promoter Tries to Roil West Side Council Race". Politicker. Retrieved 1 March 2014. 1 2 3 4 5 Simonson, Robert (January 6, 2008). "When Living at All Is the Best Revenge". New York Times. Retrieved January 6, 2008. ↑ Hoffman, Barbara (January 3, 2010). "In my library: Natasha Lyonne". New York Post. Retrieved November 4, 2013. 1 2 3 "Spoonful of Sugar". Heeb Magazine. Heeb Media, LLC. December 16, 2008. Retrieved 1 March 2014. 1 2 3 4 Hass, Nancy (July 9, 2000). "Shopping with: Natasha Lyonne; Rough, Tough, But on a Road To Ladylike". New York Times. Retrieved 19 May 2010. ↑ Landman, Beth; Spiegelman, Ian (November 27, 2000). "A Dark Grey Zone for Natasha Lyonne". New York (Intelligencer). Archived from the original on June 27, 2006. Retrieved July 16, 2006. ↑ Aschenbrand, Periel (September 7, 2016). "The Chosen Ones: An Interview With Natasha Lyonne". Tablet Magazine. Retrieved May 30, 2018. ↑ "Jews Making News: Natasha Lyonne for New Amy Poehler Pilot". Atlanta Jewish Times. March 27, 2014. Retrieved May 30, 2018. ↑ "Breakout Talent : Natasha Lyonne - Spitfire Girl". Backstage. February 21, 2001. Retrieved May 30, 2018. ↑ "USC Shoah Foundation Institute testimony of Ella Buchinger". United States Holocaust Museum. Retrieved 1 March 2014. 1 2 "Talking with...Natasha Lyonne". Pamela's Film and Entertainment Site. Archived from the original on October 27, 2009. Retrieved March 1, 2014. ↑ "Slum Pickings". People. September 7, 1998. Archived from the original on March 5, 2014. Retrieved March 1, 2014. ↑ Heyman, Marshall (October 25, 2010). "Natasha Lyonne Turns a Page". Wall Street Journal. Retrieved 4 November 2013. ↑ Cindy Pearlman (July 2, 2000). "Natasha Lyonne". Chicago Sun-Times. p. 3. ↑ Dreher, Rod (January 12, 1997). "Her Heart Is In New York". Sun-Sentinel (Fort Lauderdale). p. 2D. Retrieved November 4, 2013. ↑ "'American Pie' star files case against dad". Digital Spy. January 12, 2010. Retrieved November 11, 2013. ↑ Vilkomerson, Sara (30 March 2012). "The hell-and-back journey of Natasha Lyonne: 'I was definitely as good as dead'". Entertainment Weekly. Retrieved 1 March 2014. ↑ "Natasha Lyonne - Awards". IMDb. Retrieved 8 November 2018. ↑ "Natasha Lyonne to Star in Mike Leigh's Two Thousand Years". Broadway.com. 18 October 2007. Retrieved 20 October 2011. ↑ Isherwood, Charles (October 2, 2009). "Spandex Agonistes: Why Don't You Try It On?". New York Times. Retrieved April 21, 2011. ↑ Isherwood, Charles (6 October 2010). "Escaped Predator? What Else Is New?". The New York Times. Retrieved 20 October 2011. ↑ Van Meter, William (24 October 2010). "89 Minutes With Natasha Lyonne". New York (Intelligencer). Retrieved 1 March 2014. ↑ Isherwood, Charles (January 12, 2011). "Discord Dished Up at Every Meal". The New York Times. Retrieved March 1, 2014. 1 2 Wilson, Gemma (24 December 2010). "What's Up, Natasha Lyonne? The Blood From a Stone Star Opens Up on Surviving Her Own Career". Broadway.com. Retrieved 1 March 2014. ↑ Hetrick, Adam and Andrew Gans (May 7, 2012). "Cynthia Nixon, Natasha Lyonne, Charles Busch and Rosie O'Donnell Are Women Behind Bars May 7". Playbill. Archived from the original on March 4, 2014. Retrieved March 1, 2014. ↑ Andreeva, Nellie (18 December 2012). "Fox Developing Sibling Comedy Starring Natasha Lyonne". Deadline Hollywood. ↑ Brown, Emma (9 July 2013). "Natasha Lyonne, Locked Up". Interview Magazine. Retrieved 1 March 2014. ↑ Yamato, Jen (August 12, 2014). "EMMYS Q&A: 'Orange Is The New Black's Natasha Lyonne On Redemption And Her First Emmy Nod". Deadline Hollywood. Retrieved June 21, 2016. ↑ Andreeva, Nellie (February 27, 2014). "Ellen Burstyn To Star In Amy Poehler's NBC Comedy Pilot 'Old Soul'". Deadline Hollywood. Retrieved March 1, 2014. ↑ "Kenzo Follows Its Spike Jonze Film With a 13-Minute Surrealist Gem From Natasha Lyonne". Retrieved 2018-11-12. ↑ Andreeva, Nellie (2017-09-20). "Netflix Greenlights Comedy From Natasha Lyonne, Leslye Headland & Amy Poehler". Deadline. Retrieved 2018-11-12. ↑ "Netflix's Russian Doll: TV's answer to Groundhog Day?". The Guardian. February 2, 2019. Retrieved February 2, 2019. ↑ "Natasha Lyonne". IMDb. Retrieved 2018-11-12. ↑ Yuan, Jada (August 3, 2013). "A Day Apartment Hunting With Natasha Lyonne". New York (Vulture). Retrieved March 1, 2014. ↑ "Pie Star Lyonne Arrested for Drink Driving". ABC News. August 29, 2001. Retrieved October 20, 2011. ↑ Silverman, Stephen M. (April 19, 2005). "Arrest Warrant Out for American Pie Star - Natasha Lyonne". People. Retrieved November 4, 2013. ↑ "Michael Rapaport Driven to Despair by Natasha Lyonne". Hollywood.com. April 21, 2005. Retrieved October 20, 2011. ↑ "Access Hollywood". American Pie star’s fight for life. Retrieved June 8, 2015. ↑ "Natasha Lyonne's Major Medical Scare". The Rosie Show. October 22, 2012. Retrieved November 4, 2013. ↑ Raab, Scott (June 12, 2015). "Natasha Lyonne on Orange Is the New Black and Provocative Fan Requests". Esquire. Retrieved June 10, 2016. ↑ "Teen Choice Awards 1999". "IMDB". ↑ "Never mind Oscar, here's the 2017 FANGORIA Chainsaw Awards Nominees Ballot!". Fangoria. Retrieved 14 February 2017. ↑ "Watch Against Me! 's Sixties-Inspired '333' Video Starring Natasha Lyonne". Rolling Stone. Retrieved 2017-04-24. Wikimedia Commons has media related to Natasha Lyonne.